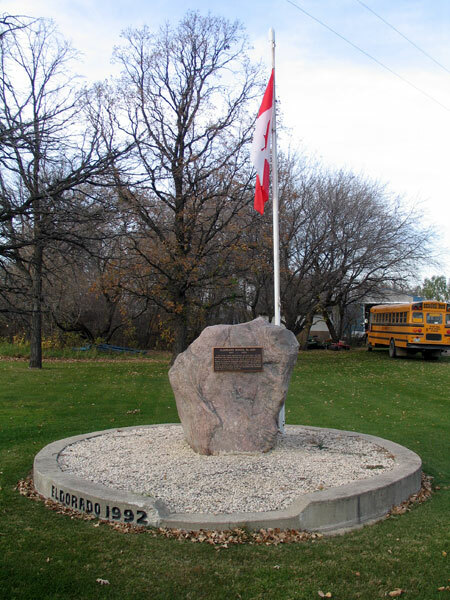 The Eldorado School District was formally organized in March 1901 and a one-room school building was constructed near the site of this cairn, in the southwest quarter of 3-6-7 west of the Principal Meridian in the Rural Municipality of Thompson. During its years of operation, about 145 students attended the school, taught by 23 different teachers. The school closed in 1959 and the district was formally dissolved in January 1960. The remaining students went to Miami Consolidated School No. 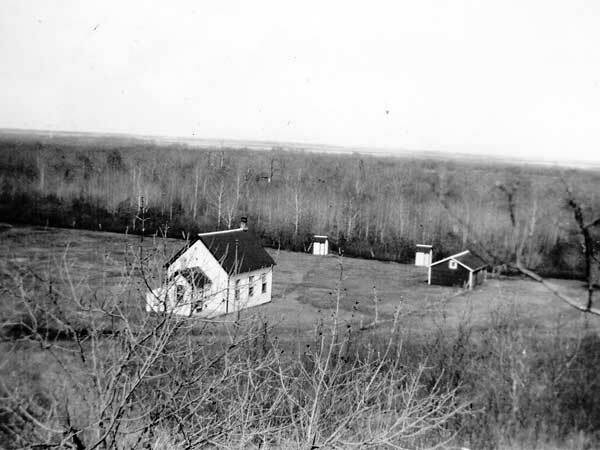 74 or Roseisle Consolidated School No. 726. The building and contents were sold at a public auction. A monument was erected in 1992. Among the teachers who worked at Eldorado School were Beatrice Farmer (1902), Mary Ellis (1903), Miss Williams (1904), Miss Woods (1905), Miss Collins (1906), Beatrice Umphrey (1909), Edna Fraser (1910), Violet Hefford (1911), Margaret Lickie (1912), Lena Tandy (1913-1914), Jennie Bardarson (1915-1916), Myrtle Hubert (1916-1918), Ella Kennedy (1918-1919), Josie Tandy (1919-1920), Dorothy Johnson (1920-1922), Elizabeth Copeland (1922-1925), Grace Latcham (1925-1927), Carol McBain (1927-1935), Lillian Gillian (1935-1938), Mary Eva Hopkins (1938-1942), Mae Knox (1942-1943), Ethel Buchanan (1943-1944), Elsie Clearwater (1944-1945), Pearl Campbell (1945-1946), Ed Baily (1946-1950), Dean Dunn (1950-1951), A. Hildebrand (1951-1953), Elizabeth Stevenson (1953-1956), James Orchard (1956-1957), and Margaret McTavish (1957-1959). GR8461, A0233, C131-2, page 61.